The State Barrier Fence of Western Australia,formerly known as the No. 1 Rabbit-proof Fence, is a pest-exclusion fence constructed between 1901 and 1907 to keep rabbits and other agricultural pests, from the east, out of Western Austalian pastoral areas. 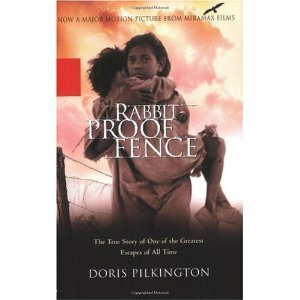 Rabbit-Proof Fence is a 2002 Australian drama film directed by Phillip Noyce based on the book Follow the Rabbit-Proof Fence by Doris Pilkington Garimara. It is based on a true story concerning the author's mother, as well as two other mixed-race Aboriginal girls, who ran away from the Moore River Native Settlement, north of Perth, to return to their Aboriginal families, after having been placed there in 1931. The film follows the girls as they walk for nine weeks along 1,500 miles (2,400 km) of the Australian rabbit-proof fence to return to their community at Jigalong, while being pursued by a white authority figure and an Aboriginal tracker.